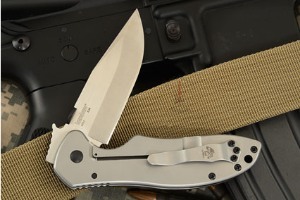 Description: Kershaw and Emerson Knives have joined forces on a series of knives that combine the precision engineering of Kershaw with Emerson's uncompromising functional design. 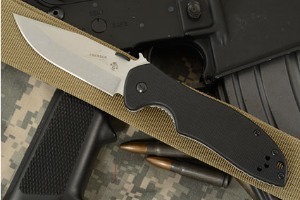 The CQC-6K (6034) is a manual opening knife using either the thumb disk or the patented Emerson "wave shaped feature." The wave enables the knife to be opened as it is removed from the pocket. By the time the knife has been fully withdrawn from the pocket, the blade is deployed and ready for use. A small wave-shaped tab on the top of the blade is built to catch on the pocket seam, opening the knife as it comes out of the pocket. This instant-open, single-handed feature is a favorite among military, rescue, and law enforcement knife users. The Emerson/Kershaw CQC-6K features a clip point blade for increased piercing capability. 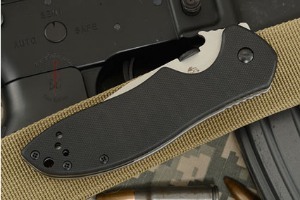 The blade is stonewashed in the grinds and satin finished in the flats. 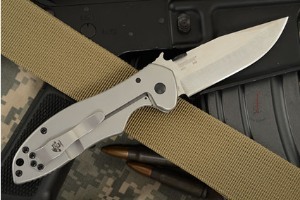 G-10 handles provide a secure grip and a framelock means safe and solid blade lock up. The liners, backspacer, screw hardware, and pocket clip have been black coated. 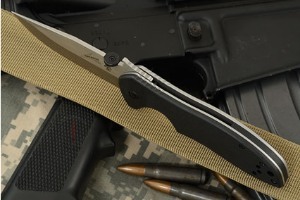 The pocket clip can be mounted for right- or left-handed tip-up carry. 0.0322265625 0.015625 32.2265625 15.625 Header Started.